"James Hunt Hesketh Team T-Shirt weiß"
Ein weiteres "must have" für jeden F1 Liebhaber. Das OFFIZIELLE Hesketh Racing Team T-Shirt in weiß mit dem Druck des Maskottchens des Hesketh Formel 1 Teams auf der Brust, der Startnummer 24 auf dem Ärmel und dem Hesketh Schriftzug auf dem Rücken. Some things are too important to be left in the past. OFFICIAL HESKETH RACING MERCHANDISE Designed and Manufactured by Retro GP. 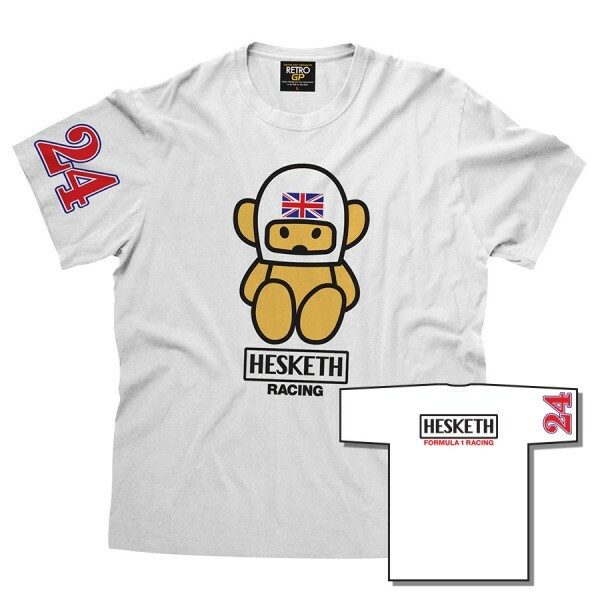 The high quality t-shirt in white has got the mascot of the Hesketh Racing Team on the chest, the number 24 at the arm and the writing HESKETH on the back. Weiterführende Links zu "James Hunt Hesketh Team T-Shirt weiß"